Please put our banner on your site. We all love Boyzone. We love their songs, their videos, their albums, their personalities -- we love everything about them, and we miss them sooooooo much! That is why we are having this petition. This petition, however, would not be successful without everyone's help. Please click on the link below which says Sign!! !, send in your signature... and it will surely be a great deal of help to all Boyzone fans around the world! 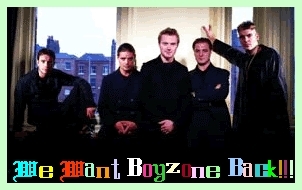 So please, please sign our petition and spread the word to every Boyzone-loving person you know! It is suggested that you make your email addresses public when signing so that when we send the petition to the Boyz, they will be able to see them. To view the signatures, click here. We would really appreciate it if you could tell your friends about this campaign.